When I got into ice climbing last season, I tore open the guidebook and drooled over the pictures of Katahdin. 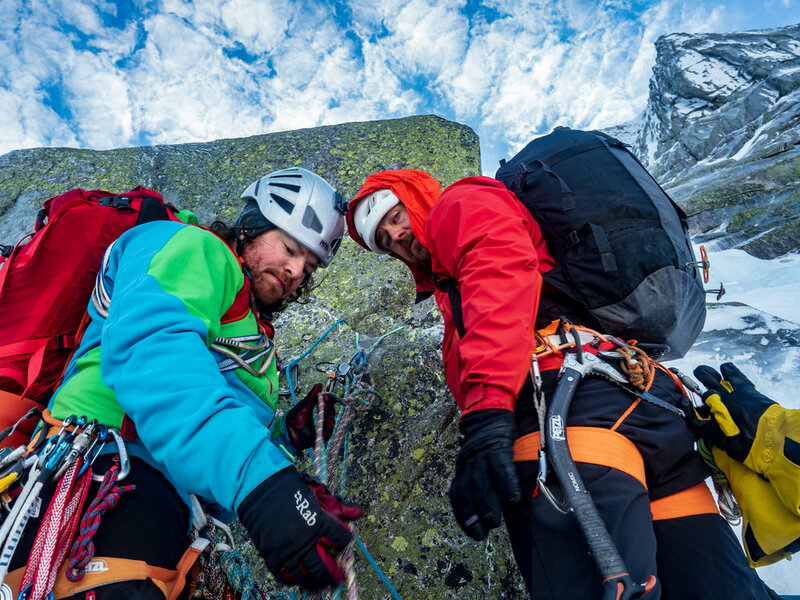 Long, 2000 foot alpine routes on the east coast!? Psh, Mt Washington couldn’t even live up to that. These are routes dreams are made of; looking more like long alpine routes out west than anything you would ever see on the east coast. However, there was a catch. 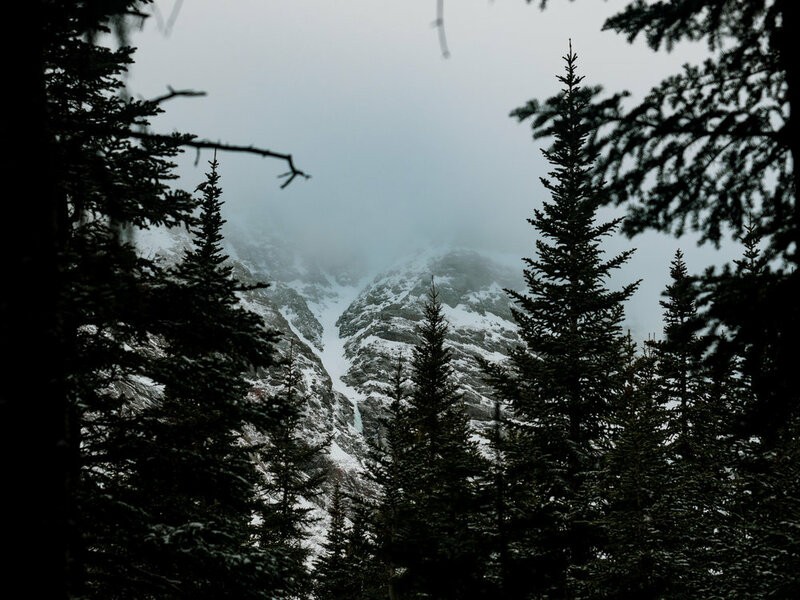 Katahdin, is inside Baxter State Park, and there are a multitude of regulations for making the trek to Katahdin in the winter. I put the idea of going in there on the back burner and knew at some point I would make the trip to the middle of Maine. Little did I know it would come a lot sooner than expected. I think it was sometime around the end of summer, early fall, when I was talking to Heath and he had mentioned wanting to get a group of people to go into Katahdin for February of 2019. He had gone in with a partner this previous year, and wanted to make another trip, but with more of a group. I remember him saying something to the effect of “You’re going to have to want to suffer.” Luckily for me, that’s exactly the kind of trip I was looking for. A week before our trip, we had a call with all of the members of the party, it consisted of Heath, Evan, Derek and I. I had never met Evan or Derek, except for small text interactions, but I trusted Heath and knew they must be pretty awesome guys. We discussed gear, clothing, routes and stoke. A week later, I took a flight after work to Boston. I arrived the same time as Heath and Jarrod, and magically ran through baggage claim and hopped on the same tram to the rental car area as Heath and Jarrod were on. It was a funny surprise when we saw each other! After getting the rental car we drove up to North Conway. The Mount Washington Ice Festival was happening that weekend. Heath, Jarrod, and Derek all rep Rab, and were manning the booth for the festival. 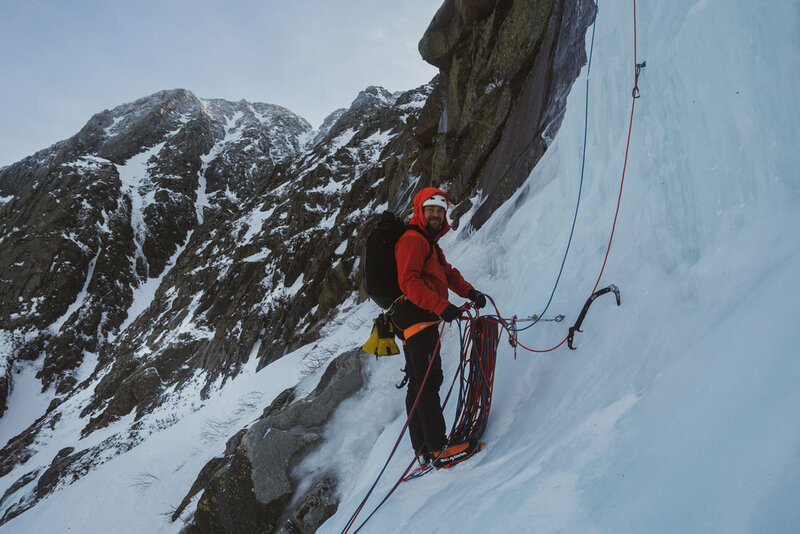 We climbed during the day, while organizing gear and Katahdin plans by night. Sunday night after the festival, Evan arrived, we packed the truck, and we were on our way. It was the night of the Super Bowl, so there was no one on the road, and every stop we made people were making comments, rooting for the Pats (obviously). We had made some sort of plan for food on the way and stopped at a Hannaford, somewhere across the New Hampshire/Maine state line. All four of us seemed to run in different directions grabbing different things. Miraculously only about 45minutes later we had a cart full of goodies, and were back on the road. We made it to Millinocket around 1am. The work began packing all of our gear for the trek into Katahdin. After two hours of gear sorting and decision making it was lights out for 4 hours. Yard sale in the parking lot before heading out. 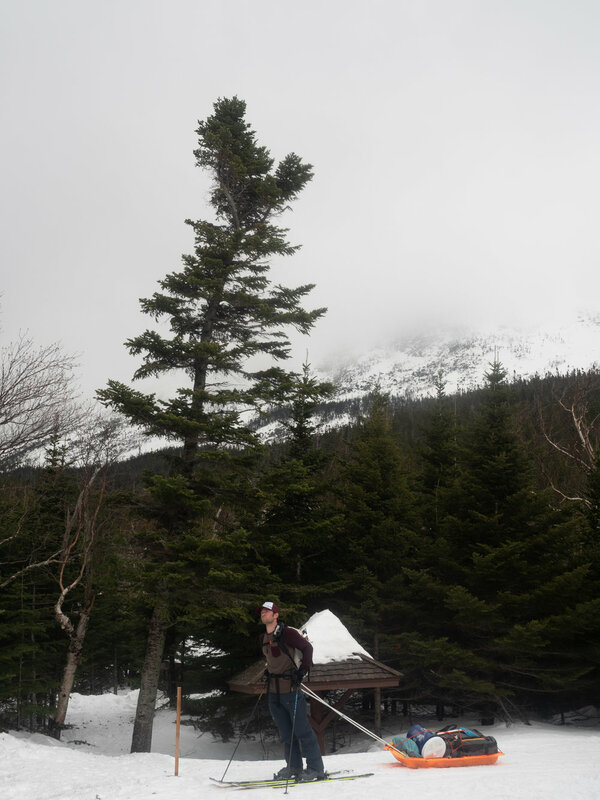 We awoke at 7, left around 8, grabbed the customary breakfast at Dunkin Donuts, and headed into Baxter State Park. 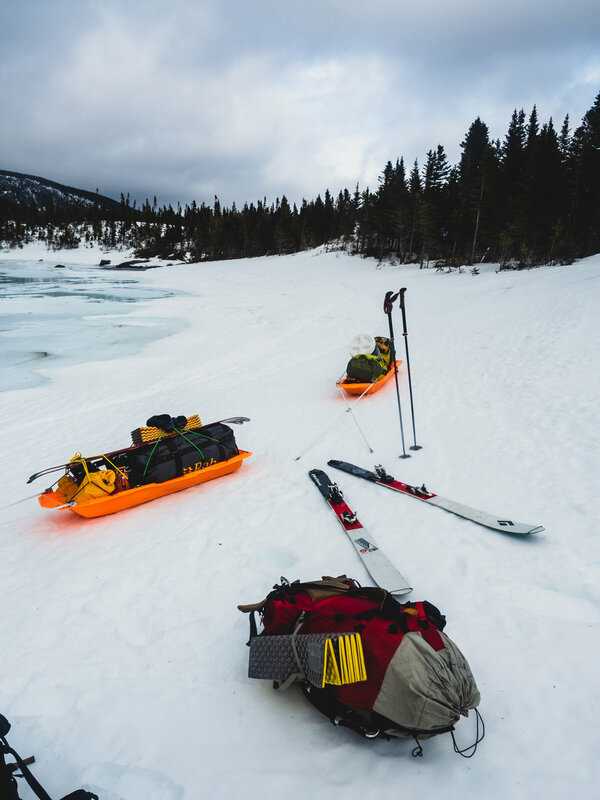 After packing up our sleds, we geared up and took off. The trail we followed was packed down with a snowmobile from rangers going in and out. We had 17 miles to go until Chimney Pond, but had our sights set on Roaring Brook Campground for a 13 mile day to start the trip. A few hours into the ski we got the hang of skiing with polks, having only a few blunders, and no lost baggage. A polk is basically a sled with rigging strapped to your backpack, designed to slide behind you as you ski. My gear probably weighed somewhere between 70-80 pounds. The combination of warm winter gear and food for 5/6 days really added up. The ski in is really boring. REALLY boring. You’re going over mostly flat terrain, with some gradual climbs and descents. There are almost no views of the mountain. I really don’t even know where the trail goes to be honest. At some points it looks like you’re going even farther away from the mountain, but you just have to trust in the process and keep skiing. We got into Roaring Brook as darkness fell. There were people in the cabin, so we snagged a lean-to. The snow was extremely deep, and if you weren’t wearing snowshoes or skis you’d posthole up to your waist. The struggle to get out when you post holed was real. After an uneventful night, we packed back up, excited to make it to Chimney Pond and catch our first glimpse of the mountain. Was there even a mountain? Was this just some crazy hoax? I wasn’t sure at this point, but we kept skiing. This day we only had to ski 3 miles, but had 2000+ feet of elevation to gain. Some of the hills were really hard to ski up with 80 pounds of weight trying to pry you back down. We took them slow and eventually made our way into the basin. Katahdin slowly rises up around you like a gentle giant enveloping you. As you get closer her cliff walls get taller and taller. I was skiing with Heath at this point, and was in complete shock and awe. It’s like somehow in the 17 miles we’d skiied our way through a portal and ended up in Alaska. We ditched our sleds and went down to the lake, and took in the whole mountain. Absolutely incredible. It was everything I had dreamed of, and read about plus some. 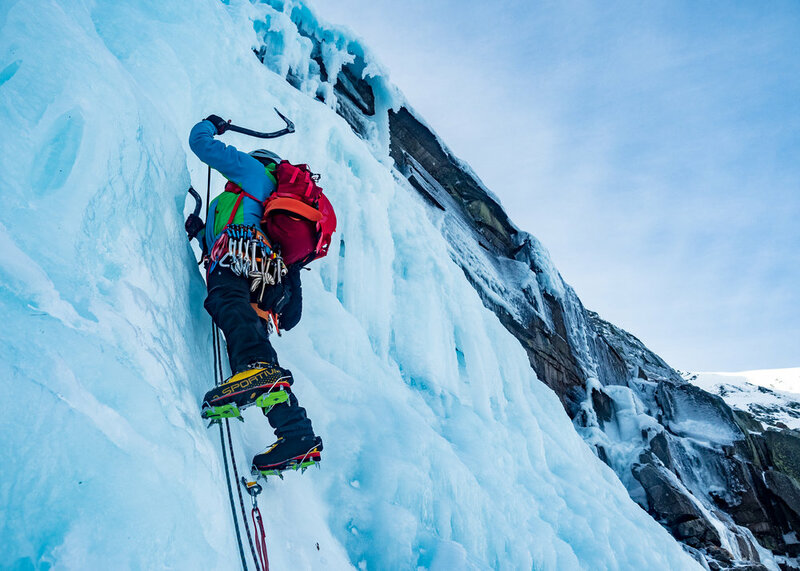 There were immaculate frozen waterfalls, huge snow fields, all interspersed between black granite cliff faces. Somehow, between trying to pick my jaw up out of the snow we made camp. The lean-tos weren’t big enough for all four of us to put all our gear, in so we split up in twos. Evan and I got to work digging out our lean-to and making it homey. We made shelves out of snow, and built a little wind block out of our sleds and snow. It worked to perfection. There was a noticeable difference in how warm it was down in our lean-to. It made sleeping really cozy. We had a tent, but didn’t need to set it up because we were so warm. The weather report for the next day was one climbers dream of, sunny, low twenties, windless, and steady through the day. Incredible. You’d better plan a big day with a weather forecast like that. So we did. I had some nerves going to bed that night. I wondered if I was ready for whatever the crux pitch would throw at us. I tried not to get too worried about it and went to bed. Waking up at one point to pee, I looked up and saw one of the most incredible night skies I’ve ever seen. The clouds had parted and I felt like I could reach out and touch the stars. It was immaculate. We woke up at 5:30am to leave by 6:30, but after boiling enough water, we ended up leaving at 7am. (If I was doing this again, I’d plan to leave camp no later than 5am) After crossing the frozen pond and ascending the snow slopes, we made it to the base of the route by 8:30. 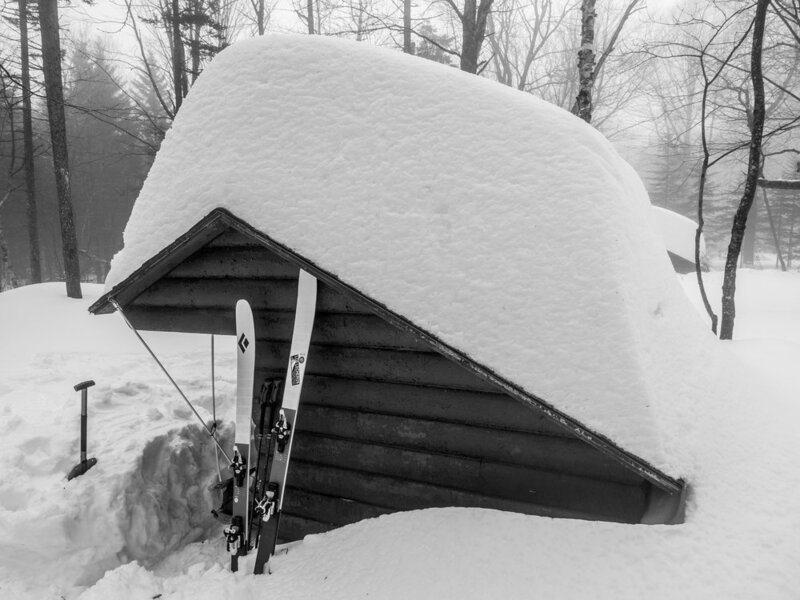 We got lucky with snow conditions and boot packed all the way up, post holing only a few times. Derek and Evan took the first leads on the 150 foot WI2 pitch. It was actually frustrating how low angle the ice was because it was a true calf burner. The next pitch was more vertical. Evan continued leading, making good work of the 100’ pitch. I followed, then took the lead, and blasted up the first huge snowfield. We ended up simul-climbing for 15-20 meters on easy snow without protection, before I set up a belay and brought up Evan. Without hassle we made it to the next ice step. The setting was absolutely incredible, weather was perfect, and spirits were high. The next ice pitch was really fun. I had knocked off all the nerves and was feeling really good with my climbing after going up this step. 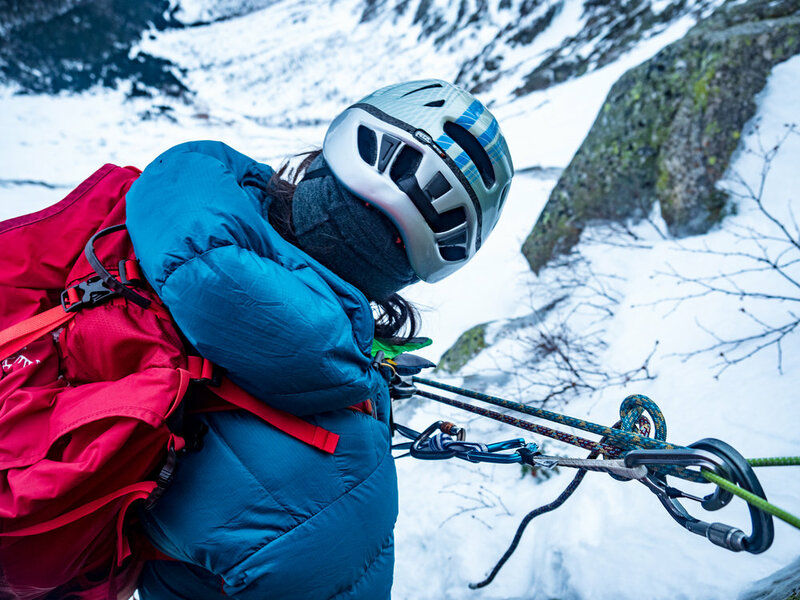 The crux pitch loomed above us and I was ready for battle. Heath and Derek were simul-climbing up the snowfield and next ice step, while Evan and I decided to pitch it out. Most of it was lower angle, so it’d be another leg burner. I reached the top of the next ice step without pause, and clipped into Heaths anchor at the bottom of the next snowfield. There weren’t many places to build an anchor. There really weren’t many places to place protection either. The crux pitch loomed a good 300’ away, about a rope length and a half. Derek was on the sharp end looking for places to put in protection. He determined there really wasn’t a good spot to build and anchor and bring up Heath. There was some wind blown snow on the upper left side of the snow field and we had no idea if that would be reactive or stable. (See picture of crux pitch and wind blown snow below) We tried problem solving, and looking at our options. Option 1, tie two ropes together and essentially solo up to the crux pitch. Option 2, traverse hard left to the cliff band and look for places to make an anchor. Option 3, bail. There probably could have been more options, but it was 2:30pm, the sun would start setting in another 2 hours and be completely dark around 5pm. We had bivy gear, but didn’t really want to spend a night on the mountain if we could help it. It felt like the logical thing to do… and it still does. But dang, going in all that way to get shut down stung. I didn’t really feel the sting until a day or two later. The motive now was getting down safely, and efficiently. Heath welded a nut into the rock we were able to rappel off of, with a .75 backing it up. Then we left a sling at another rappel station. A few v-threads later and a quadruple rappel later, we were on top of the second pitch. (quadruple rappel - we tied together two double ropes!). At the top of the second pitch it felt like we were at the wrong end of a firing range. Snow and ice were pelting down on us from the upper parts of the mountain. It made the experience really cool, until you’re the last person sitting there, you pull out the backup screw and rappel into the darkness over huge bat hangs. That was probably the most nerve racking rappel I’ve ever had. See the dark picture with the last person going over the edge to get a sense of what that looked like. I made it down to the group, we had one more rappel and finally we were back on solid ground. There was still the snow fields to go so we couldn’t let our guard completely down. By this time, it was around 6:30/7pm. Most of us hadn’t eaten or drank anything all day and were feeling it. Twenty minutes of sitting down, packing up gear, and shoving food/water into our bodies, did wonders. The walk back seemed quick. Luckily for us, we were scheduled to be in the bunkhouse that night. I brought my stuff over and it was about all I could do to keep myself from collapsing into my bunk. I had gotten a cold after leaving North Conway and was not feeling great. The next day was Heath’s birthday though, so we stayed up till midnight, playing cards and cracking jokes with the other climbers in the cabin. The following day was extremely casual, filled with sleeping in and replenishing bodies with missed food and water. Around 1:30pm, we set out to climb something on the Pamola cliffs, easy one/two pitch adventures. After choosing a fun looking line, we made the hike up to the base and geared up. Clouds kept rolling through the valley, while simultaneously covering the tops of the peaks, creating a magical view. I was really happy to be up there on the side of the mountain. Later we found out we had climbed Mini Pinnacle 2. It was a really fun climb, and extremely fat. With a deteriorating weather forecast calling for mixed freezing rain, we weighed our options. Another group was moving into the cabin that night so we were going to have to spend the night in a lean-to. After the warm front was scheduled to blast through, a cold front would bring temperatures around -10deg F. Thinking about the ski out, sleeping in -10, and packing multiple times, we decided to head out a day early and take the good snow conditions for the ski out. There was ambition and stoke that we could make it all the way out in a single push and wouldn’t have to sleep out that night. We left Chimney Pond at 12:30pm. Made it through Roaring brook by 1:30. The slog really started around 3:30pm. We almost went the wrong way across a lake at 5:30 pm. At 6:30pm, exhausted but ecstatic we made it back to the truck. It took us probably an hour to pack up the truck and get going. It was such a good trip. I had a ton of fun climbing with these guys and was able to learn a few things along the way. Katahdin is such a cool playground, and we didn’t even scratch the surface. I’d love to spend more time up there, exploring the different basins and what they offer in climbing and skiing. I guess now I’m hooked and I’ll have to get stronger and come back at some point. Congrats if you read all of that. Happy Trails, until next time!